Obverse: Crowned King Henry IV armoured with sword in right hand over shoulder and shield in left hand standing in ship sailing right, shield with quartered arms of England and France, ropes 3 / 2, two annulets on rudder. Text around HENRIC DI GRA REX ANGL Z FRANC , double saltire stops. Reverse: Floriated cross with lis at end of each limb, pellet and H in centre, crowned lion at each angle, within tressure of eight arcs, trefoil in one quarter. Text around IHC TRANSIENS PER MEDIVM ILLORV IBAT (But Jesus passing through their midst went His way), double saltire stops. History: During Henry IV’s reign there was a shortage of gold and silver so coins were minted in reduced quantities. 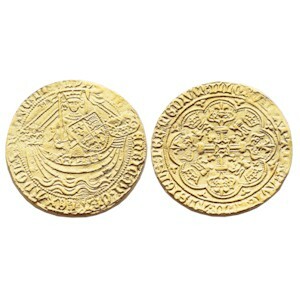 In 1412, near the end of Henry’s reign the standard weights of the coinage were reduced, partly due to the shortage of bullion and partly to provide revenue for the King, as Parliament had not renewed the royal subsidies. Heavy coins worth more than their face value were melted to make the new light coinage. As in France, the royal arms were altered, three fleur-de-lis taking the place of four or more lis previously displayed.